"This is may be the biggest storm that we have had"
Hundreds of thousands of people remain without power in Washington DC and nearby states after a blizzard blanketed the area with record snows. 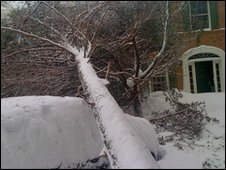 Electricity was cut to at least 300,000 homes as the snow felled trees, and cut power lines. Emergency workers are struggling to restore power. Washington got up to 2ft (61cm) of snow, one of the heaviest snowfalls in decades. The storm disrupted transport from West Virginia to southern New Jersey. A record 3ft (91cm) of snow fell on Maryland. Washington DC, Virginia and Maryland have declared emergencies, allowing them to activate the National Guard to help cope with the wintry onslaught. Some 300,000 homes are without electricity in Maryland and neighbouring Virginia - the two states which bore the brunt of the storm. Another 250,000 customers were hit by blackouts in Pennsylvania and New Jersey, the New York Times reported. Pepco electric company said its workers were scrambling to restore power, but warned it could be a few days before everyone was back up. "We have a lot of scattered outages and the road conditions are not really working with us," spokesman Andre Francis told AFP news agency. The massive storm brought the nation's capital to a virtual standstill. All flights were cancelled out of Washington's national airport, along with most flights out of Dulles International in Virginia. The 18in (46cm) recorded at Reagan National Airport was the fourth-highest snow total for the city. While at Dulles, outside Washington, the record was shattered with 32in (81cm). A weather forecaster at the National Weather Service (NWS) at Dulles airport told the BBC the snowstorms would be reducing in the next few hours. The NWS has cancelled all storm warnings, but said gusty winds could lead to icy conditions, blowing snow, and reduced visibility along the mid-Atlantic coast throughout Sunday. Even President Barack Obama fell victim to "snowmageddon", as locals - including the president - have dubbed it. A tree limb snapped and fell onto a vehicle in Mr Obama's motorcade, but no-one was injured. All across the region, hundreds of car accidents were reported, but only two fatalities - a father and son who died while helping another motorist in Virginia. US national rail service Amtrak cancelled a number of trains between New York and Washington, and also between Washington and some southern destinations. The latest storm comes less than two months after a December storm dumped more than 16in (41cm) of snow in Washington. The Washington Metro was operating only on underground lines, and bus services were cancelled. The usually traffic-heavy roads of the capital were deserted, and the city's famous sites and monuments were covered with snow. Debi Adkins, who lives just outside the city of Baltimore, told the BBC: "I'm not going anywhere - I couldn't if I wanted to. You just can't get your cars out. The front door of the building I live in is closed shut, so I just can't get out." 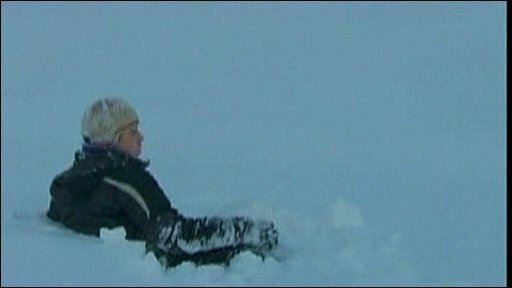 Some sight-seers ventured out in thigh-deep snow along the famous national mall, or went cross-country skiing down empty boulevards. Others took part in a huge snowball fight at DuPont Circle, a major Washington thoroughfare, organised via Facebook and Twitter. 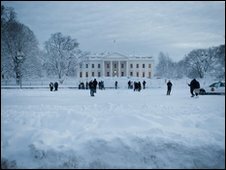 US government offices in the Washington area closed four hours early on Friday, and forecasters warned of a difficult commute on Monday morning. Are you in the eastern US? How are you coping with the snow storms? Send us your comments using the form below. Send your pictures and videos to yourpics@bbc.co.uk, text them to +44 7725 100 100 or you have a large file you can upload here.